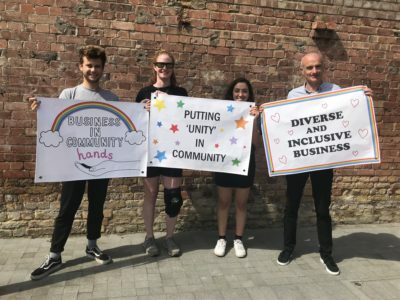 Ahead of Pride in London this Saturday, our Communications Coordinator, Matt, explores what pride means to community business. On Saturday 7 July, Power to Change will be hosting a community business float at this year’s Pride in London. It’s the first time the community business sector will be present at the parade which celebrates the LGBT community and takes a positive stance against discrimination, stigma and violence. But why, you may be wondering, does pride matter to the community business sector? What’s the point in us being there? I’ve been going to pride events for some years now and they are truly the most joyful and gay (in both senses of the word) events in the calendar! Pride is characterised by a spirit of hedonism, hope and diversity and it re-affirms, yearly, the queer community’s commitment to being visible, celebrating difference and resisting violence. It’s an event about turning power on its head and rejecting narratives of the LGBT community which lead to us feeling ashamed or embarrassed about who we are. For me, pride is about greeting a hostile and inhospitable world with kindness, joy, and love. And that takes formidable amounts of confidence and courage. I believe that there are some glaring similarities between the spirit of pride and the spirit of community business. Community businesses similarly refuse to let the powers that be define their communities. They refuse to let austerity rip their communities apart and take action to define their communities themselves – taking back control of their local assets and creating vibrant places to live. In many ways, they exemplify the positive change and hopefulness that pride is all about! They turn areas let down and forgotten about into glittering, sparkly, rainbow-coloured places to live and that takes a great deal of determination and strength. Equally, community businesses are, by their nature and organisation structure, inclusive and diverse spaces. They embody fairer and more equitable business models and promote ethical business practices that deliver real social impact. They work ceaselessly to promote diversity and to make their local areas better places to live. That’s why we’re showcasing community business at Pride in London this year – to spread the word about their incredible work and to show the unyielding amount of dedication and pride they take in their communities and local areas. From everyone at Power to Change, Happy Pride!